A terrible tragedy has happened to the KING FAMILY in Tasmania. 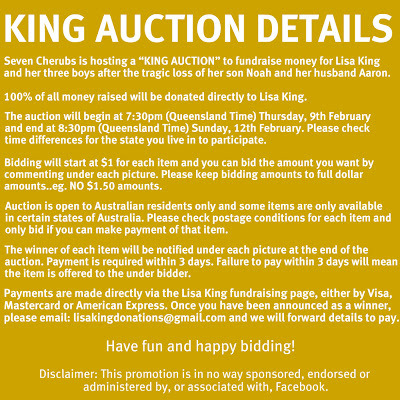 The “KING AUCTION” is to fundraise money for Lisa King and her three boys after the tragic loss of her son Noah and her husband Aaron. 100% of all money raised will be donated directly to Lisa King. 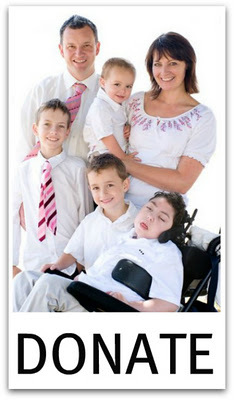 Her friend Naomi has used her Blog, Seven Cherubs for good and reached out to the world to help. And the world has responded….last I saw about $30,000 had been donated. I do not know Lisa and her family, I cannot comprehend the grief and experiences they are going through. I do know Naomi. She is honest and faithful. You can trust her. Lisa is a women in need. Naomi is able to help meet that need.